A new report released this month shows how Aboriginal people in the northern basin have overwhelmingly ranked environmental watering as a significant factor in their lives. The survey, to find out the importance of environmental water to Aboriginal people, was undertaken by the Murray–Darling Basin Authority, in partnership with the Northern Basin Aboriginal Nations (NBAN) in December 2015. Among those surveyed were Aboriginal people from the communities of St George and Dirranbandi, in southern Queensland, and Brewarrina in northern New South Wales. The findings show Aboriginal people regularly use waterways — mostly rivers — for recreational, cultural, social, spiritual and economic purposes. Of greatest importance is maintaining biodiversity, or what is known as healthy Country. According to NBAN, when seasonal water is available to the environment, Aboriginal culture strengthens and the health and wellbeing of Aboriginal people improves. The peak Aboriginal body also says the results show that water enables physical, social and mental health and is a fundamental resource for Aboriginal knowledge, science and belief systems. Participation in ceremony on Ngemba Country — the Ringbalin tour, 2010. On a local level residents in St George value their livelihood above anything else, or what is known as Financial capital. This includes bush tucker and forms of employment that depend on a healthy environment. But for Aboriginal residents in both Dirranbandi and Brewarrina, biodiversity, ecosystems and the health of the land is of most importance. This is what is known as Natural capital. This research is important because it is the first time the direct relationship between environmental water and the effect it has on Aboriginal peoples’ lives has been quantified. This survey shows Aboriginal people in the north of the basin have a high stake in the outcomes from environmental watering. All elements of cultural life are significantly affected by the availability of water in the system. It makes it clear that more water for the environment, which leads to healthier rivers and wetlands, benefits Aboriginal people. Those surveyed also praise the fact that they have been able to participate in research that is relevant to the planning and management of water. So how can this research be used? Researchers have identified the need to conduct further study in relation to the link between environmental watering and Aboriginal socio-economic development. They have also suggested the survey tool used can be modified and used by non-Aboriginal communities to assess the value of environmental water to their sociocultural interests in the basin. This research will also be taken into account as part of the Murray–Darling Basin Authority’s review into the northern basin. 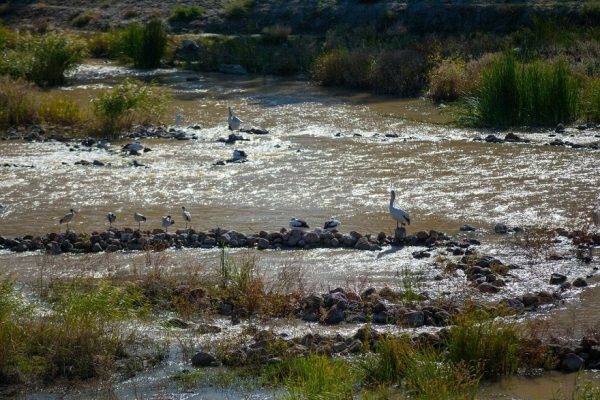 Aboriginal fish traps in Brewarrina, which demonstrate the Aboriginal connection to water. Photo by Josh Smith. Become part of our community by featuring your projects on Riverspace. It’s easy, find out how.